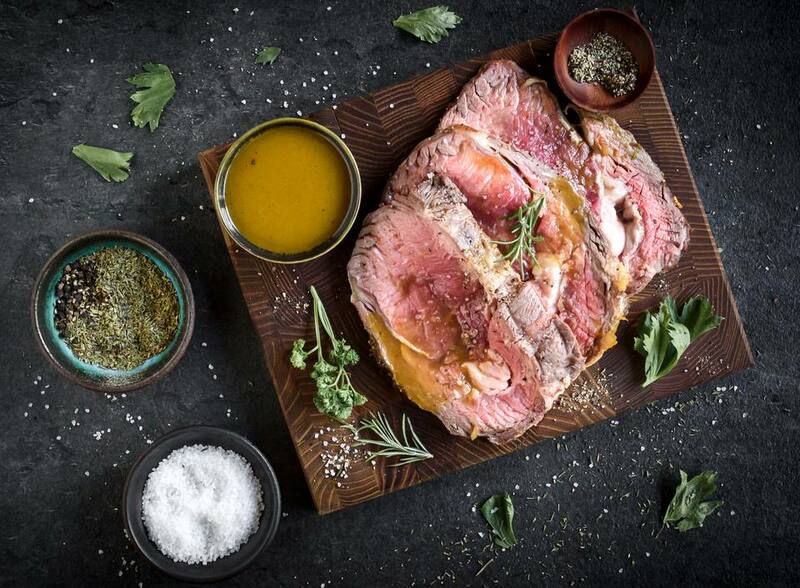 This prime rib roast is cooked using a very traditional method of roasting it at a high temperature for a few minutes and then reducing the heat and finishing the cooking at a lower temperature. This technique produces a perfectly medium-rare prime rib with a gorgeous brown crust on the outside. It will work equally well for either a bone-in or boneless prime rib of beef of between 4 and 18 pounds. For a bone-in prime rib, figure two servings per rib, while a boneless roast will yield two servings per pound. Half an hour before you start roasting, pre-heat your oven to 450 F and season the roast generously with Kosher salt and freshly ground black pepper. When you're ready to cook, set the roast in a roasting pan with a rack, fat-side-up for a boneless prime rib. Or for a bone-in prime rib, skip the roasting rack and just set the roast bone-side-down in the roasting pan. Insert a meat thermometer or a digital probe thermometer into the deepest part of the meat, being careful not to hit bone. If you're using a digital probe thermometer, set it to alert you when the meat hits 120 F (see note below). Roast for 20 minutes, then lower the heat to 325 F and roast until the meat's internal temperature reaches 120 F, which will be another hour to three and a half hours, depending on the size of your roast. When the prime rib hits 120 F, take it out of the oven and transfer it to a cutting board and cover it with foil. Leave the thermometer in! You're going to want to rest the meat for 30 to 45 minutes, during which time the temperature will continue rising to around 130 F, which is perfect medium-rare, and then drop back down to 120 F.
When it hits 120 F it's fully rested and ready to slice and serve. Try pairing it with a simple au jus recipe you can make while the meat is resting, or a creamy horseradish sauce. For medium-rare prime rib, take the roast out of the oven at 120 F. It will continue cooking until it reaches 130 F. If you prefer a medium prime rib, take it out at 130 F with a target temperature of around 140 F. Either way, you'll still want to rest the meat until it comes back down to 120 F before carving it.